IMPROVment® is an integrative method that emphasizes physical and mental fitness by encouraging our participants to create their own movement in response to multiple auditory prompts. At the core of this practice is the liberating idea that an infinite number of movement ideas can emerge from a single cue. There are no “wrong” movement choices. Class participants take chances in an atmosphere free from judgment or preconceived notions of what dance should look like. The class community is a supportive and engaging one. Through community classes, training workshops, scientific research, publications, and performances, we empower movement for brain/body health in older adults. We’re holding our first training in March 2019! For more details and registration please click on the training tab above. Learn a bit about Christina, and the work she does at Wake Forest. 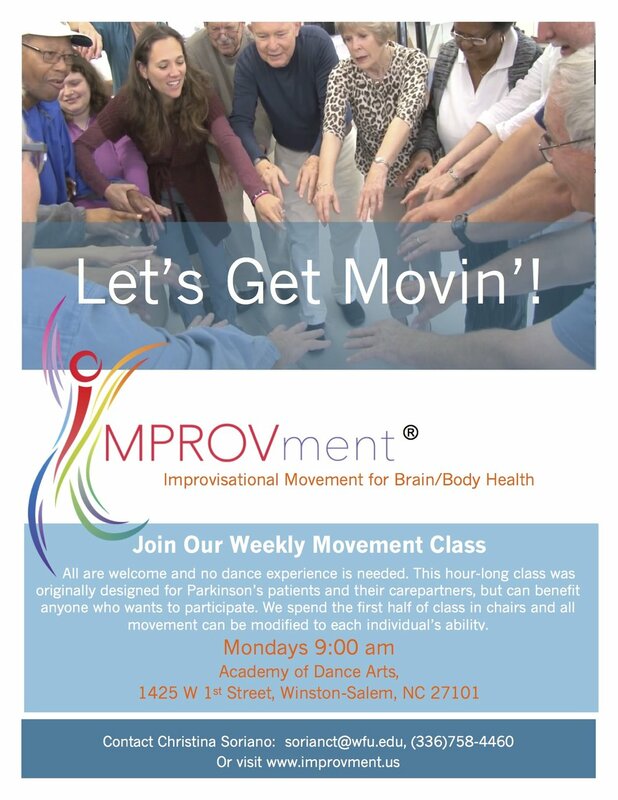 Currently, there are two regular IMPROVment®-based classes held on a weekly basis in Winston-Salem, NC. These classes, taught by Christina Soriano and her students, are tailored to the unique abilities and needs of the Parkinson's community, the Alzheimer's community, and the general aging (retirement home) community and their caretakers. These supportive, creative environments are dynamic and constantly growing. We would love to have you in class. Parkinson's Class at Academy of Dance Arts- taught by Christina Soriano, Jessie Laurita-Spanglet, and student assistants from Wake Forest. Explores self-generated dance from auditory prompts in chairs, at the barre, and in center. Dementia Magical Movement Class at Tab Williams Senior Services- taught by Wake Forest Students: Rachel Caskey (graduated), Allie Williams (graduated), Alice Romanov, Kamryn King, Kelly O'Keefe, and Donna Moseley. Features chair dancing and stretching. 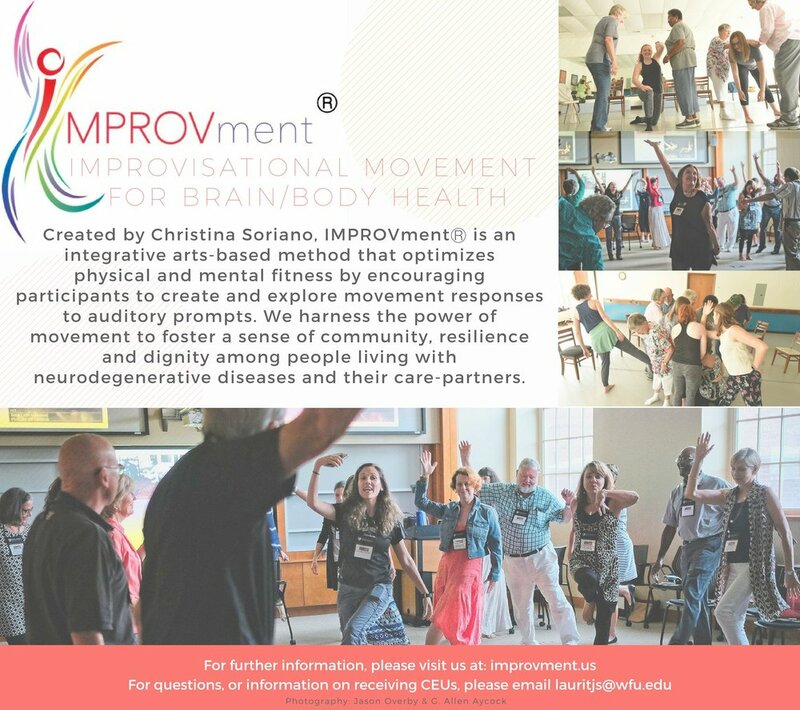 The study we are asking you to participate in is designed to better understand how improvisational movement and social interactions affect the bodies and minds of people with early-stage memory loss and their care partners. Christina Soriano, MFA and Christina Hugenschmidt, PhD are looking at how this IMPROVment® method can improve quality of life. This research is in collaboration with WFU and is funded by the National Institutes of Health (NIH). If you think you or a loved one qualify for this study please call our study team. 336-713-MOVE or 336-713-6683. The freedom to move easily and adapt to real life challenges is a fundamental part of the human experience. Movement freedom allows individuals to enjoy a sense of agency and thrive in an ever-changing environment. As we age, being spontaneous can get harder, especially for someone with a neurodegenerative disease. Using movement as a vehicle for generating physical decision-making, Christina has been developing a class for older adults based on the premises of self-generative movement. IMPROVment™ emphasizes physical and mental fitness. As its name implies, the teaching philosophy encourages participants to create their own movement in response to multiple auditory prompts. At the core of this practice is the liberating idea that an infinite number of movement ideas can emerge from a single cue. There are no “wrong” movement choices. Class participants take chances in an atmosphere free from judgment or preconceived notions of what dance should look like. The class community is a supportive and engaging one. Group classes encourage socialization and an overall sense of well-being. Improvisation is cognitively challenging and requires spontaneous decisions. Dance has been shown to decrease fall risk and help with balance.